If your instructor prefers that you do not indent your paragraphs, you must still double-space your lines, but you will need to use quadruple-space between paragraphs. 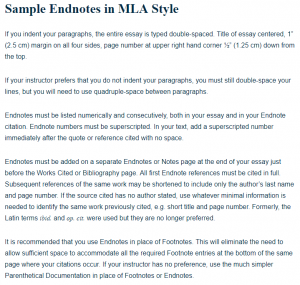 Endnotes must be added on a separate Endnotes or Notes page at the end of your essay just before the Works Cited or Bibliography page. All first Endnote references must be cited in full. Subsequent references of the same work may be shortened to include only the author’s last name and page number. If the source cited has no author stated, use whatever minimal information is needed to identify the same work previously cited, e.g. short title and page number. Formerly, the Latin terms ibid. and op. cit. were used but they are no longer preferred. Recommended reading on Footnote citation MLA. Begin your Endnotes page by centering the title Endnotes or Notes 1″ (2.5 cm) or about 6 lines from the top of the page. Double-space your entries, indent each Endnote citation 1/2″ (1.25 cm) or 5 spaces from the left margin, do not indent subsequent lines, add a superscripted Endnote citation number at the beginning of each citation, leave one space after the superscripted number, and list entries in the same numerical order as they appear in the text of your paper. For samples of numerous other Endnote citations, please see MLA Handbook for Writers of Research Papers, 6th ed., pages 300-313. 1Alan Dundes, “Taboo,” World Book Encyclopedia. 2000 ed. Site created and designed by Marcus V. Gay, 18 Jan. 2005 <http://www.occultopedia.com/ t/taboo.htm>. 3 Mary Douglas, “Taboo,” Man, Myth & Magic, ed. Richard Cavendish, new ed., 21 vols. (New York: Cavendish, 1994) 2546. 1996, BME / Psyber City, 18 Jan. 2005 <http://bme.freeq.com/tatoo/tattab.html>. Douglas, Mary. “Taboo.” Man, Myth & Magic. Ed. Richard Cavendish. New ed. 21 vols. New York: Cavendish, 1994. 2546-2549. Rothenberg, Kelly. “Tattooed People as Taboo Figures in Modern Society.” 1996. BME/Psyber City. 18 Jan. 2005 <http://www.bme.freeq.com/tattoo/ tattab.html;. If you feel you need any assistance with formatting Endnotes in MLA Style, Please Follow the Link.